The next year, she climbed Mount Kilimanjaro, the highest peak in Africa. 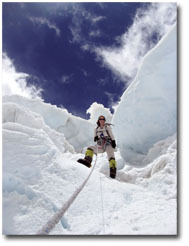 In 2003, she set out to climb the Seven Summits—the highest mountains on each of the seven continents. She accomplished that goal last summer when she summited Mount Everest, the world’s tallest mountain. After snapping a few photos (including one of her with a flag given by fellow Daughters of the Malibu Chapter, Malibu, Calif.), it was suddenly time to go. While climbing the other famous summits of the world can take between a week and four weeks, reaching the top of Mount Everest takes two months, due to weather conditions and strong winds that can keep climbers in their tents for days at a time. She attempted to reach the top in 2005, but after two months on the mountain and the summit nowhere in sight, she had to turn back. “When I left my kids, I told them I’d be home in two months, and I wanted to keep my promise to them,” she says. Her son, Johnny, 17, is planning to summit Mount Everest this year, and her youngest daughter, MacKenna, 12, will take on Mount Kilimanjaro with her mother as soon as she turns 13. She’s also found another love through mountain climbing—her fiancé, Todd Burleson, who has climbed Mount Everest nine times. He proposed to Ms. Wells in Kathmandu, Nepal, the day before she left for base camp. With that can-do attitude, Ms. Wells is looking forward to accomplishing her next goal. She’d like to be the fastest woman to climb the Seven Summits. And, yes, that means she’s going to have to take them on all over again.